Scotland manager Gordon Strachan thinks David Moyes can take solace in the fact that getting the sack is so commonplace in English football. Strachan commended Scotland's top-flight clubs for their patience, with only one manager dismissed this season. But Moyes became the the English Premier League's 10th casualty when departed Manchester United on Tuesday. "I don't think there's that stigma to getting sacked anymore," said Strachan when asked about his fellow Scot. "And the good thing is, you get paid a lot if you get sacked in the English Premier League." 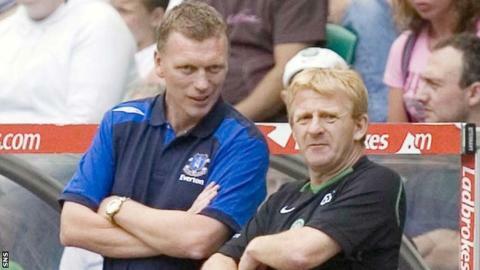 Strachan, who played in midfield for United, did not wish to join those who had commented on his former club's decision. "I think David will be delighted that I am going to say nothing about it because I think that, as a manager, you don't want to be patronised," he said. "You don't want to speak about something you don't know too much about." However, he suggested that United's decision would not have the personal impact on Moyes' career that it would have had more than five years ago. And he used the example of Tony Pulis, who left by Stoke City last summer but has pulled Crystal Palace clear of relegation trouble this term. "Years ago, it would be a real blemish on your career if you got the sack," said Strachan. "You felt bad about it, people look at you differently, but I think there's so many sackings these days that nobody bothers. "[Look at] Tony Pulis . . . he comes in and could possibly be the manager of the year." Three years ago, seven English top-flight clubs started the season with Scottish managers and now there's only one - Paul Lambert at Aston Villa. "We'll come back again," insisted Strachan - who himself managed Coventry City, Southampton and Middlesbrough as well as Celtic - when asked whether it was a trend that would continue. In Scotland, only Hibernian have dispensed with their manager this season. Irishman Pat Fenlon left Easter Road, with Terry Butcher moving from Scottish Premiership rivals Inverness Caledonian Thistle to replace him. "It is great there's only one managerial change in Scotland this season," suggested Strachan. "That's fantastic. It shows you that the chairmen have belief in their managers and we have patience." However, the national boss thought finances heaped added pressure on top English clubs. "I think there have been 10 managerial changes, two at Fulham," he added. "Some clubs will say it was great to change because we've stayed up, some will say it was a waste of time changing because we're going down. "That's where it is in England at the moment because, I think, the money determines a lot - money and shares. "Chelsea over the last 11 years have won the same amount of trophies as Manchester United - one keeps their manager for a long time, the other one changes their manager every year, so what's right?"